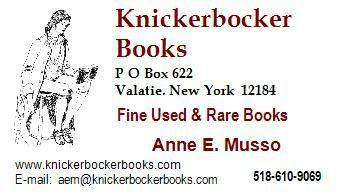 In 2011 Knickerbocker Books relocated to beautiful Columbia County - midway between the cities of Hudson and Albany. We are in the heart of Knickerbocker country, a source of inspiration to author Washington Irving, and home to many historic sites associated with Dutch colonial America. We offer top quality used books, primarily scarce or out of print titles on a range of topics: art, photography, architecture and design, children's books, literature, biography, and history - especially New York State, New York City, Yonkers and Hudson River Valley history. We also carry a selection of vintage post cards, photographs and ephemera. Our books are available through several online services, such as Abebooks, Alibris and Biblio.com. Click here to connect to our Online Catalog. Contact us at 518-610-9069. We accept direct orders with check, money order or PayPal payments.